1.100% Pure & Natural Extraction: ISUDA Essential Oil adopts the latest steam-pressing techniques, extracts plant extracts directly with no impurities. Bring you the 100% Pure and Natural essential oils. 3.Set of 6：Multiple choice of essential oils scents provide multiple aromatherapy healing, cleansing and fragrance benefits- Lavender, Peppermint, Eucalyptus, Lemongrass, Orange and Cedarwood Essential Oil. 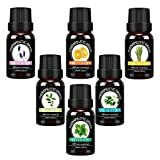 4.Multiple Applications: You can use this Essential Oils for massage, diffuser, cleaning or bath.